Healthy Workplaces Derbyshire Programme is a new and innovative service that aims to provide workplaces across Derbyshire with the tools and information to create a healthy workplace. The programme can help your workplace to become more productive, healthier, and safe and create a happier workforce. Healthy Workplaces Derbyshire is a free health and wellbeing programme that is tailored to your organisation's specific needs and requirements. Support and guidance is provided to take steps to improving the health and wellbeing of your business and staff. Exercise classes at Chesterfield Borough Council. We can help you to identify any key health and wellbeing issues within your business and then help you work towards finding simple and effective solutions. Whether it's helping improve staff's mental wellbeing or helping to get your workplace more active we can offer as much, or as little, help as you need. The free programme is aimed at all businesses across Derbyshire whether a small, medium or large organisation. 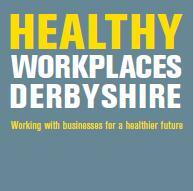 To find out more about how your workplace can benefit from the Healthy Workplaces Derbyshire Programme you can visit the website or click on the information leaflet below.